When you need protection without shrinkable characteristics, use one of our Non-Shrink Sleevings. Expandable Polyester Sleeving (BD220) is a light-weight, encapsulating sleeving designed to expand and adjust to irregular surfaces to protect cable bundles and wire assemblies. It is braided from polyethylene terephthalate monofilament which offers cut-through, chemical and fungus resistance in addition to abrasion resistance. Push the sleeving over large fittings to expand its size. Once over, expandable sleeving becomes a snug, form-fitting cover that adjusts to irregular shapes and contours providing abrasion resistance and protection with a minimum of bulk and weight. Polyester expandable sleeving is available as a standard U/L recognized product rated for 125°C. It can also be supplied with the added feature of flame retardance (BD221). Also U/L recognized for 125°C, the flame retardant version carries U/L's highest VW-1 rating. Fiberglass sleeving is designed for heat resistance along with a variety of coatings to meet specific thermal and dielectric requirements. Heat treated (BD213) fiberglass is designed for applications up to 1200°F. It is annealed to remove any organic impurities and to improve its fray resistance. It is often used where air gap electrical insulation is sufficient, particulary where high temperatures are encountered. Vinyl coated (BD210) fiberglass is coated with a specifically formulated vinyl designed to provide high dielectric strength and good heat resistance. Rated for continuous operation at 130°C its excellent flexibility and toughness makes it ideal for many applications. The vinyl coating is flame retardant and is Underwriters approved VW-1. Acrylic coated (BD211) fiberglass is a flexible fully cured acrylic coating applied to a tightly braided fiberglass sleeving. This coating offers excellent cut-through resistance and compatibility with most varnishes, resins and wire enamels. 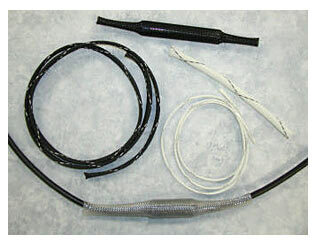 Rated for continuous use at 155°C it is ideal for insulating motor leads and a variety of instruments. 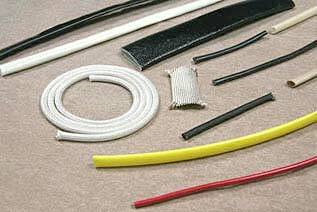 Silicone coated (BD212) fiberglass is a highly flexible sleeving designed for use at temperatures up to 200°C. It also retains its flexibility at temperatures as low as -70°C. This sleeving is compatible with most high temperature insulation systems, exhibits excellent corona resistance and is self-extinguishing leaving only a non-conductive ash. Its applications are widespread because of its large operating band and includes insulation of leads and connections in transformers.